Government debt may often be a confusing topic when addressed as a whole and not broken down and discussed by level. Due to the various types of government debt, it is important to be familiar with the structure of each level of government. There are three main levels of government in the U.S; the Federal Government, the State Government and the Council Government. Since all of these levels have different taxation mechanisms to finance their activities, each level is able to issue their own debt but the scope of the debt can vary greatly. Within these three main levels, another type of debt held by government agencies exists which is called intergovernmental debt. But this is not the point of the article, precise information on what governments do with the debt issued it is very well explained in their websites. The question is if the promises of all Governments to return the amounts of money they are borrowing are just written in soft chalk. The Federal debt has the lowest risk of default. Knowing this, we also need to consider that there is a huge amount of Federal debt in the market, so when investors start to feel that the amount of debt issued is bigger than what the government can afford to pay back that debt will become risky too. 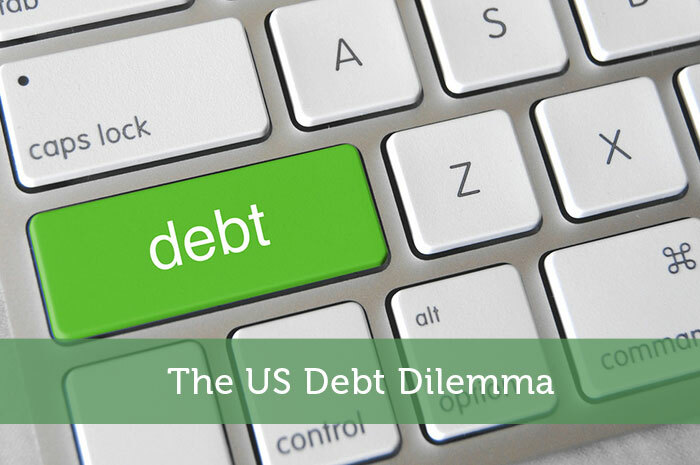 Efforts to reduce the current debt may not yield results in the short term, and will instead force the US government to consider increasing its financing resources before suffering adverse consequences. In other words, to raise taxes if the debt wants to be paid back. The inability of the county to pay for its obligations would lead to a collapse of their treasury and would damage the general performance of the economy. Apart from exceptional cases, changes in the ratio of public debt / GDP depend on three main factors; the national account of the balance of payments, the interest rate on debt and economic growth. These factors are responsible for the solutions that can be applied to counteract the high level of debt. Reports of the International Monetary Fund (IMF) as “A Modern History of Fiscal Prudence and Profligacy” notes that between 1970 and 2011 there were 22 cases in 16 countries in the world in which its public debt to GDP ratio was reduced by 10 points or more. By looking at these cases, one is able to see certain common behaviors, as the primary account surplus is 4% of GDP, economic growth of 3.6% and intervention rates at 3%. How likely it is to replicate these behaviors to reduce debt today? Apparently this possibility is very small. First of all, the world today is greatly indebted, especially the developed economies (60% of GDP and more). The amount of money taken from the budget of each country to pay down the debt has increased, leaving the National Government with fewer resources to implement their policies. The US Government has issued around $17 trillion in debt itself. And the GDP of the last 12 months in the US is reported around $16.7 trillion. While many newspapers had headlines such as “US debt already represents 100% of the country’s GDP,” this is not quite accurate, because the sum of all the levels of debt would amount to $19 trillion in debt. States and councils have issued around $2 trillion in bonds and obligations. If private debt is taken into account, the number rises to $64 trillion including households, mortgages, businesses, financial institutions, and all types of public debt. That total represents 400% of the national GDP. But one thing is what the country produces, and another thing is what the Government can generate in total revenue through taxes. The Government’s total revenue for 2016 it is expected to be around $3.5 trillion. So they owe the equivalent to the 500% of their income in national debt. 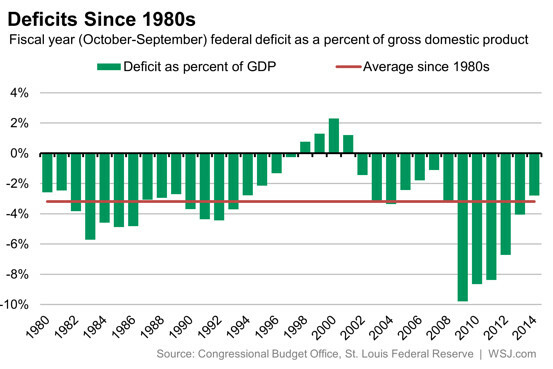 Not mentioning the $464 billion deficit expected in the 2016 Federal budget. The only way to reduce the debt is through inflationary policies where the Government prints money and can significantly reduce the annual amount of new debt and make it easier for old debtors to pay back what they owe including the government itself. In Europe, the political debate centers on whether to implement measures of fiscal austerity. To understand the effectiveness of a policy of this magnitude one must observe the behavior of inflation in Europe. After the crisis, most of its economies had weak inflation data and even deflationary trends, which means that the demand and growth was still weak and may not be ready to face a new shock or adjustment of that magnitude. However, there were also positive effects. Fiscal adjustment can boost the confidence of the economic agents in those governments to see them as more cautious. In addition, it creates an incentive for private investment and increases the flow of financial resources for the private sector. Confidence is gained in the markets and Governments balance their accounts to eliminate structural deficits. Conclusively, there may be little improvement to the high debt levels for a long period of time. The main reason is that it is nearly impossible to return a debt that represents more than 100% worth of the national GDP and keep the welfare system. As in the case of many European economies like Germany, France, Italy and Spain in which their constitutions promise to maintain certain social rights under any circumstance. In the case of the US it is a bit different because the levels of taxation are lower compared to Europe and the medical care system is private. The only solutions may be in rising taxes for the top 10% of contributors and by reducing spending on the Army. Apple, Alphabet (Google), Microsoft and Facebook are worth $1.8 trillion all together in the stock market. Their turnover is about $500 billion, and their net profits $86 Billion. Governments will have to target these multinational corporations in order to be able to pay the debt back.